I wanted to create an animated splash page for my Ionic 2 app. Upon a quick Google search, I found that this was largely impossible, with exception to this hack. Unfortunately, this hack was only relevant to Ionic/Angular 1 apps. Using the same basic HTML and CSS tips from that article, I easily adapted the code to work with Ionic 2. In fact, the process is much more simple with fewer lines of code. If you prefer watching a video tutorial.. I've recorded a full video tutorial regarding the process of creating an animated Ionic splash page. Be sure to subscribe to the channel for updates when I release new tuts! I'm going to make the assumption that if you're interested in creating a splash page, then you already have the Ionic CLI (Command Line Interface) installed. If not, and you're brand new, please watch our free ionic 2 course here. You don't have to use the tabs starter template, you could use blank or anything else. I'm choosing to use it because it's prepopulated with pages, which will allow us to demonstrate that the splash page does not load every time the particular page is visited. We only want it to load once the app loads, right? Right! The #custom-overlay div will cover the entire screen. We're using style binding set to a CSS display property. If the splash property is true, it will set it to flex, if not, it will set it to none . The .flb class and everything inside of it is optional. The key ingredient here is #custom-overlay. The associated CSS ruleset makes it cover the current page. Anything else within it is up to you and the needs of your splash page. The rest of the CSS rulesets simply center and vertical align an SVG logo. If you viewed the demo and noticed the complex animation sequence applied to the logo, there's a lot of code! Fortunately, I didn't code it by hand. Instead, I visited Bounce.js. This allows you to select a preset animation on the left dropdown, preview it, and click export CSS . This will open up a large text area that allows you to copy the @keyframes animation that makes that given animation sequence possible. So, you can do that if you wish. For now, I'm not going to paste that large amount of CSS here in this tutorial. The following code will vary slightly if you're using a tab-based Ionic 2 layout. I will make notes of what you need or don't need based on whether or not you're using a tab layout. There's a little bit of extra work required if you're using tabs, because the splash page will not cover the bottom tab bar. The above code hides the tab bar upon the app loading, and then shows it within the setTimeout() function. The same thing is happening in both scenarios with the splash overlay itself. The splash property is set to true by default, and then in 4 seconds (4000 ms), it's set to false. 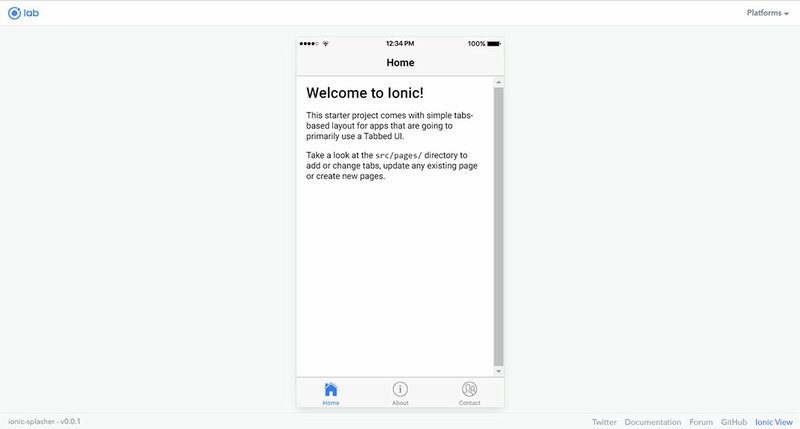 The Ionic-CLI enables a default splash screen that loads when an app is launched. We don't need that anymore. You will need to time the setTimeout delay appropriately based on the animation that's occurring in your CSS. Now, you don't necessarily need to animate your splash page. You could do any number of things, now that you have the possibility of utilizing HTML and CSS for your ionic splash page. You could even embed a full-screen video if you wish! Say something about this awesome post!